Simon Ortiz’s seminal children’s book , The People Shall Continue, was first published forty years ago. My tattered classroom copy can now be retired, as the publisher has just released a special anniversary issue. The People Shall Continue tells the history of Native and Indigenous people in North America, from their beginnings to the challenges they have faced ever since the first European settlers arrived. 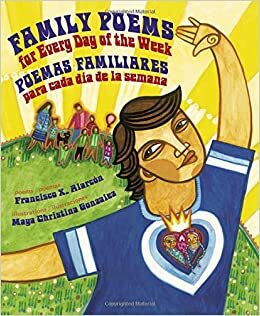 Family Poems for Every Day of the Week is a joyous whirl through the seven days we march though, endure, and enjoy. I loved the way Alarcon wove his Latino traditions and family stories into each poem day. The illustrations by Maya Christina Gonzalez were full of vibrant colors and feast for the eyes, as well. Celebrate this week: Nonfiction (with help from Ralph Fletcher)! and this week was all about putting some of those ideas into practice, and we began with nonfiction readalouds, an idea inspired by a chapter entitled: Where Have All The Nonfiction Read=Alouds Gone? Where indeed? In room 2o2, read aloud all kinds of fiction and poetry…but non-fiction? Not so much. Fletcher says: “We need to marinate our students in the best nonfiction we can find”, so that’s what I set out to do this week. and revising our thinking. Bit by bit, we are assembling (as Fletcher suggests) a “Criteria List” of craft moves the authors use to bring these stories alive (even at 7:50 in the morning!). And, bit by bit, my kids are beginning to see that fiction and nonfiction have much in common – beginning with strong storytelling. Best of all, nobody is bored, as they had imagined they would have been, reading this sort of powerful nonfiction. That is a very good thing, and we celebrate this! I knew I had struck a teacher’s goldmine when I brought what I had learned from Kylene Beers and Bob Probst’s Notice & Note into my sixth grade classroom. The signposts, together with “What we know/What we wonder” from Dorothy Barnhouse and Vicki Vinton’s What Readers Really Do, transformed the way we approached reading fiction, as well as the way we talked and wrote about our reading. So, I was thrilled to learn that a nonfiction Notice and Note was in the works, and waited (and waited…) until that day finally arrived and a copy of Reading Nonfiction:Notice & Note Stances, Signposts, and Strategies was finally in my hands. This book had to discuss a stance that’s required for the attentive, productive reading of nonfiction. It’s a mindset that’s open and receptive and receptive but not gullible. It encourages questioning the text but also questioning one’s own assumptions, preconceptions, and possible misconceptions. This mindset urges the reader both to draw upon what he does know and to acknowledge what he doesn’t know. And it asks the reader to make a responsible decision about whether a text helped him confirm his prior beliefs and thoughts or had enabled him to modify and sharpen them, or perhaps to abandon them and change his mind entirely. That is a tall order for teaching! Thankfully, Kylene and Bob guide us through this involved and complicated process with wisdom and humor. Reading Nonfiction is organized into four sections in such a smart way. I. Issues to Consider: Here, Kylene and Bob present ten issues that collectively helped formulate their ideas in writing this book. These issues span ways in which we can define nonfiction, the developmental demands we need to take into consideration when choosing appropriate texts for our students, and the issue of rigor and relevance ( “rigor is about relevance and not about a Lexile score” – let’s have a collective amen for that! (p.49). I loved this thoughtful section, which addressed so many of the questions and concerns I have been mulling over for some time. This questioning stance was a game changer in my classroom, it gave us a lens through which to view the text, a perspective with which to read more attentively and therefore more meaningfully. The discussions that these questions opened up for us were amazing for I could see real, purposeful engagement with the content of the text. As Bob writes, these questions allowed my students to think “more deeply about what we’d read. Perhaps that’s because we weren’t just reading facts on a page. We were thinking about how information fit with what we already knew. That helped make the reading more relevant.” This is exactly the kind of reading that sticks, because kids own the process. These signposts dovetail perfectly with the three Big Questions, “they help students think about the Big Questions with more specificity” (p. 118). I am so looking forward to introducing them to my students, knowing that they will help us dig deeper into all the informational reading that we will be engaged in, especially when we begin our nonfiction unit of study. As with the signposts for fiction, these will enrich not only our reading work, but also our writing work. …these strategies have two things in common: they require students to do some rereading of a text, and they encourage students to talk about what they have read. Both practices – rereading and talking – have been shown to be important in improving students’ comprehension” (pg. 184). Some of the seven strategies were familiar to me, but I confess that I have not used them in as targeted a way as Kylene and Bob describe. So, I look forward to giving them another go this year, with better success. The appendices are filled with lists of resources, text samples, links to templates, and QR codes directing the reader to videos of classroom discussions – a wealth of useful information! So, there it is, a guide to another Beers & Probst must read, must have in your library /new book list. It was hard waiting for it…but so worth the wait!